1 Hour Anniversary Rickshaw Ride - The Raleigh Rickshaw Co. Celebrate your anniversary in the most memorable way possible, a quiet and romantic ride around downtown Raleigh on a rickshaw. 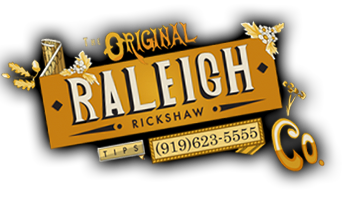 Our driver will pick you up at any location (check with us for rickshaw boundary areas) for a quiet ride through Raleigh. Some of the highlights of an anniversary night ride might include the serene Capitol grounds, our beautiful historic neighborhoods, or through the nightlife of the city streets. Chilly outside? Our driver will provide a blanket. It’s your time and we’re there to make it special and memorable. We’ll even bring a rose for your special someone – just relax and enjoy the ride. For questions, call Donald Mertrud at (919) 621-2060 for more information. -- Please Choose an Option --	No, Thank You Yes! -- None -- No, Thank You Yes! If Yes, where would you like to stop for your picnic?